The deli department at Auclair’s Market has been continually evolving since 1918. We have seen the Deli grow from a small percent of our business to one of our biggest perishable departments. A lot of this growth came about by observing and accommodating our customer changing needs. Our Deli is known for quality, freshness and friendly customer service. We stock a large selection of cold cuts, cheeses, salads, and we feature Boar’s Head deli products as well as other well known brands. We are also proud to offer our own deli salads prepared daily in our kitchen. These salads to name a few are: Ham Salad, Chicken Salad, Tuna Salad, Lobster Salad (available seasonally), Seafood Salad and a variety of pasta and vegetable salads. We prepare and bake our own signature dinner pies, which include: French Canadian Meat, Salmon, Chicken, and Chourico. You know something is cooking when you smell our smoker! Our smoker is a big hit. Some of our specialty smoked items include: Pulled Pork, Baby or St. Louis Ribs, Ham Hocks, & Pecan Smoked Salmon! For the person on the go we offer delicious sandwiches , rotisserie chickens, and hot or cold store cooked food to go. 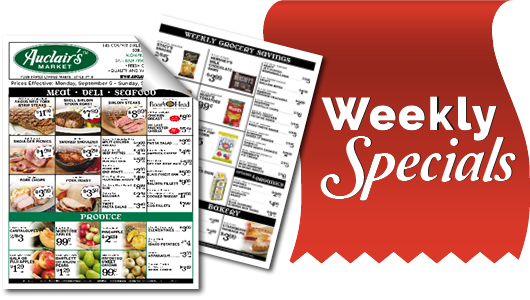 Feel free to call and ask for the deli for a list of the day’s entrees and hot soups. Please keep in mind that our prepared food can be purchased cold ready for you to heat up at home. To end your week, you will find our homemade chili made fresh every Sunday in our deli. 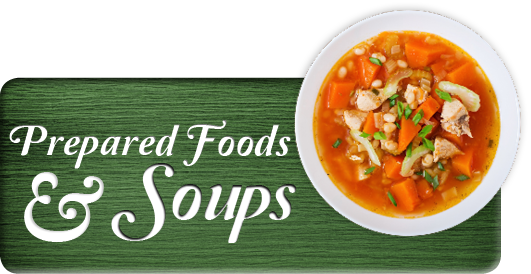 The soups, chowder, chili, and stews are sold by the pound; for a large gathering they can also be purchased more economically by the gallon.Stop by, there is always something new and delicious being created by our chefs!